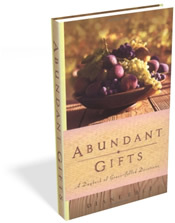 Want to give Abundant Gifts as a gift? Here's how. Supplies are limited, so don't miss out by waiting. Once my supplies are gone, they are gone for good! 1. Decide which edition you want. (see below) Same price applies to either one. 2. Order the book online (via secure server) using Paypal. You can use a credit card with Paypal, or your Paypal account. When you order, you have the option of shipping to a different address. If this is a gift, and you want me send a wrapped, personalized copy of the book directly to your loved one, please check "ship to a different address." Then, in the "Comments/Special Delivery" box, specify which cover you want, and type in the recipient's name and perhaps a note about them. If you prefer to send a check, that's okay too. Send a check for $14.97 (plus either $3.99 media mail shipping or $5.45 priority, US orders only) to: Diane Eble, 0S430 Jefferson, Winfield, IL 60190. I’ll prepare your order when I get your email (see #3 below), and send it out as soon as your check clears. 3. Whichever way you order, please send an email to me ( )with the recipient’s name and a bit about them (especially whether currently a believer or not) so I can personalize it. Also include where you want it sent—full name and address. If you order more than one book, make it clear which book you want to go to whom, and where! Please also include your phone number in case I have a question about your order. Diane, I want my copy now.